Putting together a Spa Themed DVD Release Party for the movie "Mirror, Mirror" does not require magic to be the fairest evening of all. Here is my plan for an evening with eight of my gal pals this coming Saturday. Since I am the consummate entertainer my basement houses a large inventory of party related decorations, tables, and serving ware. All other materials, food, and drink will be gathered from my local Walmart using the gift card ThinkJam provided to make this night extra special. Here are six main categories I use for all party planning. Mirrors and reflective decor will be the foundation. In the movie the color Gold is a key component so I'll dig in my fabric stash to look for some remnants for accents. I have a large mirror I'll place as a focal point of course! The lighting will be dimmed to create a spa-like ambiance and the smell of lavender will hint the air and aid in a relaxed mood for my guests. ThinkJam in coordination with 20th Century Fox Home Entertainment graciously has provided Spa Party Take Home Favors for each guest. I'll save the details as to what they are for my after party post! Aside from the entertaining camaraderie of a girl's night of pampering there will be a couple movie related game sheets provided by ThinkJam that will keep the night flowing. 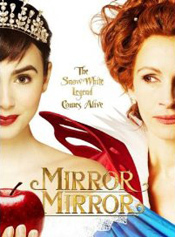 Once the spa treatments are finished, the entertainment pampering will begin with the viewing of the movie "Mirror, Mirror". I watched it yesterday with my husband and daughter. It is a great movie! It is on again as I type, as requested by my fair princess. The DVD is available today, this is one movie that is best to be added to your personal movie library. It will be watched over and over again! I'm looking forward to this party and sharing this wonderful movie with friends. Stay tuned for a post party post with pictures! *I have been provided a copy of the movie, party favors, and a Walmart gift card to facilitate throwing this party on behalf of ThinkJam & 20th Century Fox Home Entertainment. Any opinions and ideas expressed are purely my own.